MiroClogs are one of the best clogs available today. Made in Croatia by Croatian, nothing to do with China. Miro is also looking for business partners as distributors. You can contact Miro at the number and email below. I endorse it wholeheartedly. 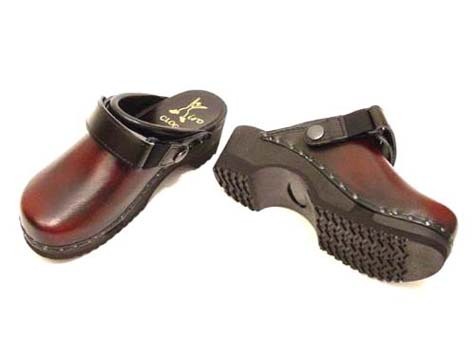 Those Wooden Clogs are flexible, comfortable and anatomically designed to support the arch. And I love the logo, that actually describes Miro as he is. Flexible wooden clogs designed and handmade in Croatia. Manufactured from best natural materials - leather and wood - Miro Clogs are unique, and offer more than you expect. Select from many different models and styles. Milano is by far our most popular model. It looks and fees great either on a man's or woman's foot. In addition to its classic shape, the color makes it appropriate to wear with any style and color of daily clothes. These are virtually maintenance free, as the color burgundy is virtually immune to specks of dirt.